After a full day and a half of sailing, this morning we arrived in one of the world’s greatest cities: Istanbul. We woke up early to watch our arrival in the only city in the world to straddle two continents (Europe and Asia). Unfortunately the weather was rainy and cloudy, but it was still gorgeous. I can only imagine how pretty it is on a sunny day with the sun’s rays reflect off the old mosques and churches. We passed through the Bosphorous strait on our approach to the city. At a major crossroads of the world between the Black Sea and Sea of Marmara, Istanbul is Europe’s most populous city with more than 13 million inhabitants. 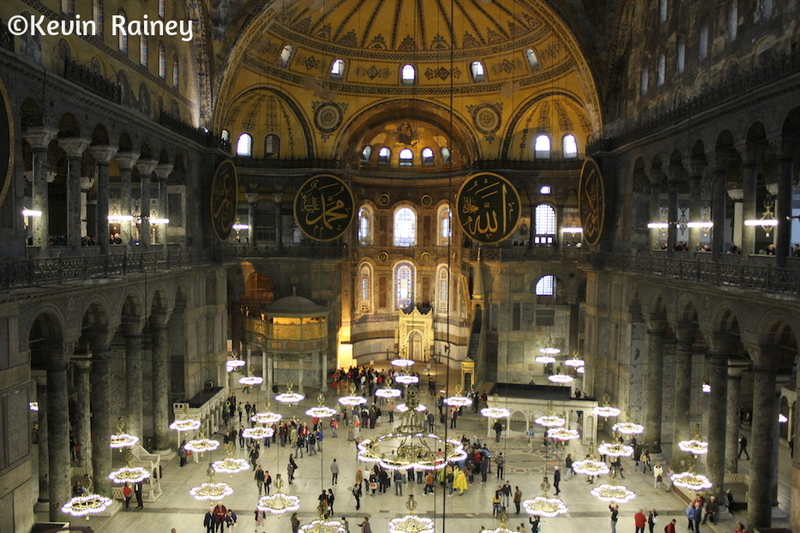 Istanbul is home to some of the most significant religious buildings in the world. 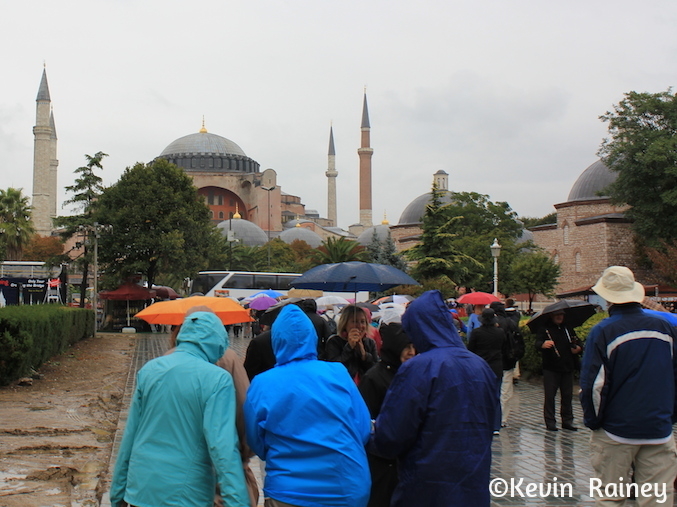 We saw both the Blue Mosque and the Ayasofya looming magnificently over the city. As the Wind Surf prepared to anchor, we were sad to leave our magnificent ship behind for the last time. We disembarked around 7:30 a.m. after breakfast and walked into the Karaköy International Maritime Passenger Terminal to meet our guide Essin for a full-day tour of Istanbul. 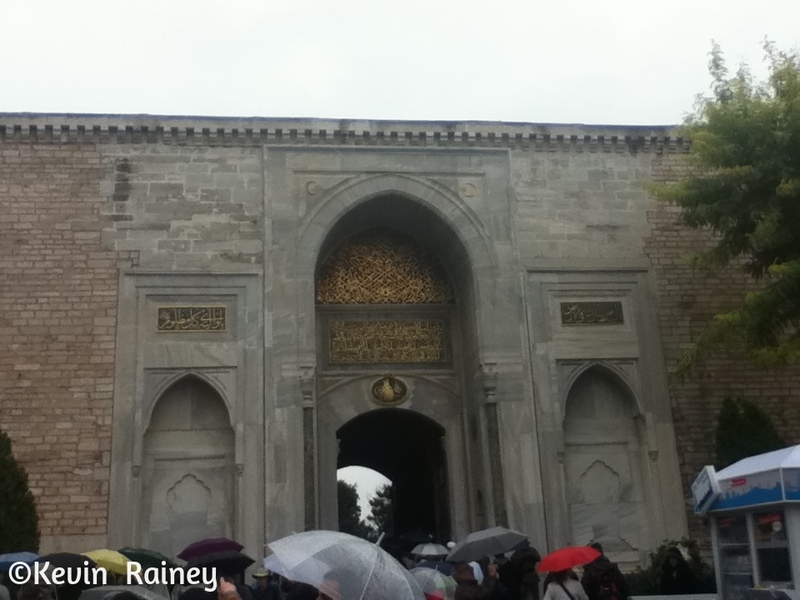 As we boarded a bus, our first stop was Sultanahmet Meydani (Sultan Ahmet Square), an important old square in Istanbul. In previous times, it was home to the Hippodrome of Constantinople. We saw a few remainders of the Hippodrome, which was essentially the sporting and cultural center of Constantinople. Like an ancient Royal Ascot or Churchill Downs, horses and chariots raced the Hippodrome. We also saw other surviving monuments including the Serpent Column (Tripod of Plataea) and Obelisk. The Serpent Column was relocated from Delphi to Constantinople in 324 AD. It celebrates the Greek victory over the Persians during the Persian Wars in the 5th century BC. Theodosius the Great ordered the pink granite Obelisk brought from Egypt in 390 AD. It was originally located at the Temple of Luxor and dates back to 1490 BC. 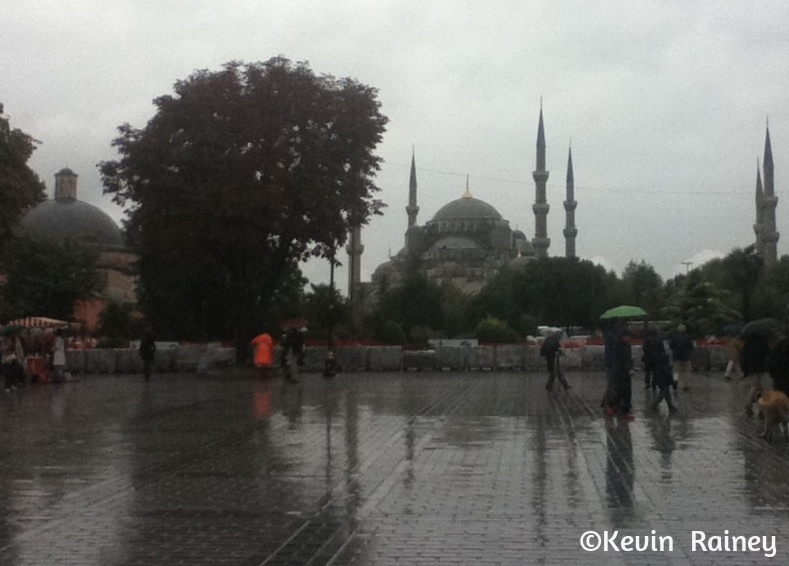 After seeing the Hippodrome, we visited the Blue Mosque, also known as the Sultan Ahmed. 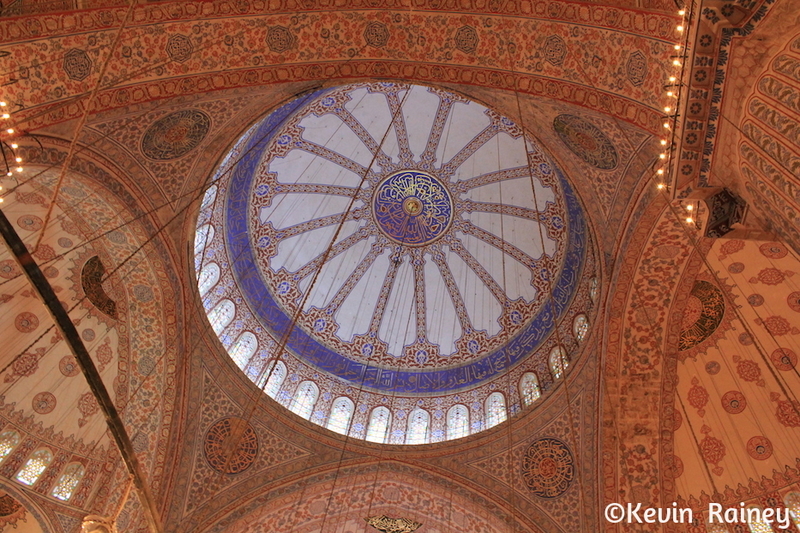 Completed in 1616, the Blue Mosque is so named for the blue tiles adorning the interior walls. The mosque contains 8 domes and is crowned by one main dome, in addition to six 8 minarets. Non-Muslims generally are not permitted from entering many famous mosques in the world, but the Blue Mosque is an exception. As non-Muslim visitors, we could enter by the door on the south side of the mosque from the Hippodrome. It’s also important to note that non-Muslims may not visiting during the five daily prayer times and women must cover their hair. Upon leaving our shoes at the entrance, we could hardly believe how large the mosque was. Thousands of worshippers could be welcomed inside. The main dome is absolutely massive and beautiful chandeliers, top by ostrich eggs, lit up the interior. Apparently the ostrich eggs repel spiders from building cobwebs! Thousands of beautiful carpets, donated by worshipers, cover the floor. The Blue Mosque features more than 200 colorful stained-glass windows. However, I was most impressed by the blue tiles that covered the interior domes – more than 20,000 tiles in 50 different tulip designs. It was absolutely stunning! Once we collected our shoes, we headed next door to the Ayasofya, one of the world’s greatest holy buildings. 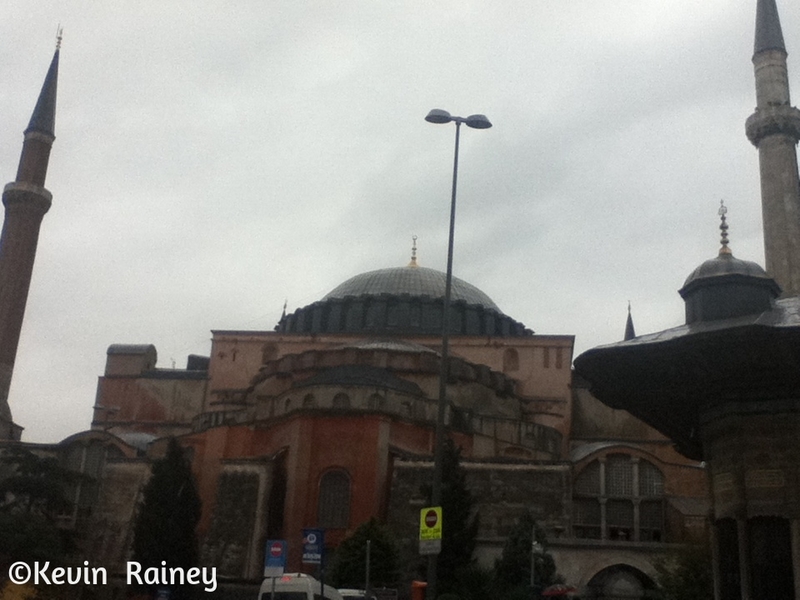 The Greek name is the Hagia Sophia, which means Holy Wisdom. 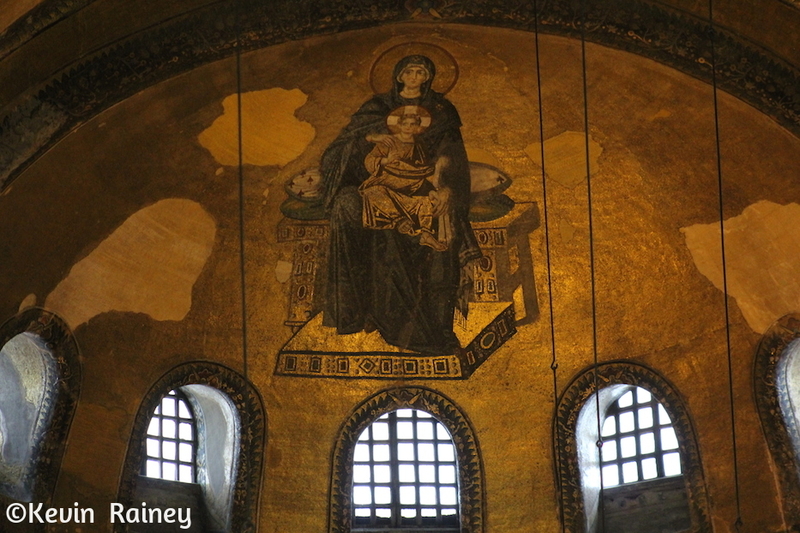 As we walked through the basilica, we felt like we had stepped back in time to witness the history of Istanbul. In previous times, the Hagia Sophia was the centerpiece of the city that was then known as Constantinople, capital of the Byzantine Empire. 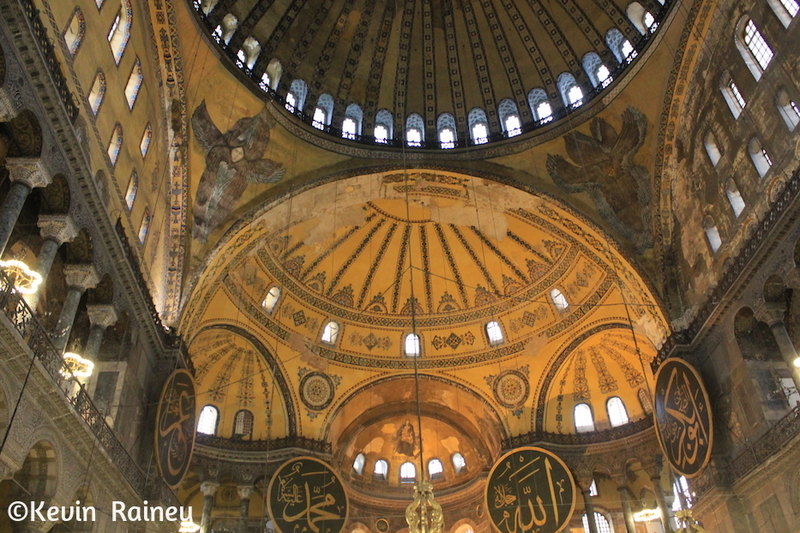 From 562 until 1453, the building served as the main cathedral of the Eastern Orthodox Church. Then from 1453 until 1931, it was an imperial Mosque. 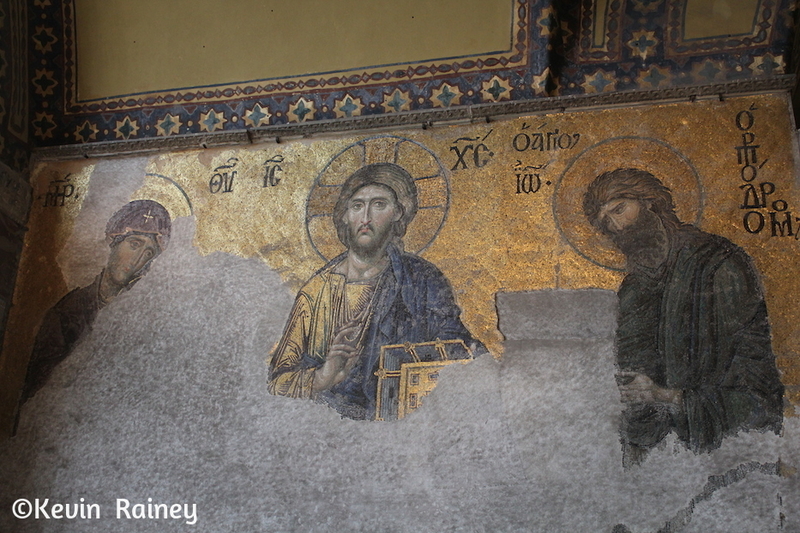 Today, the Ayasofya is a museum. 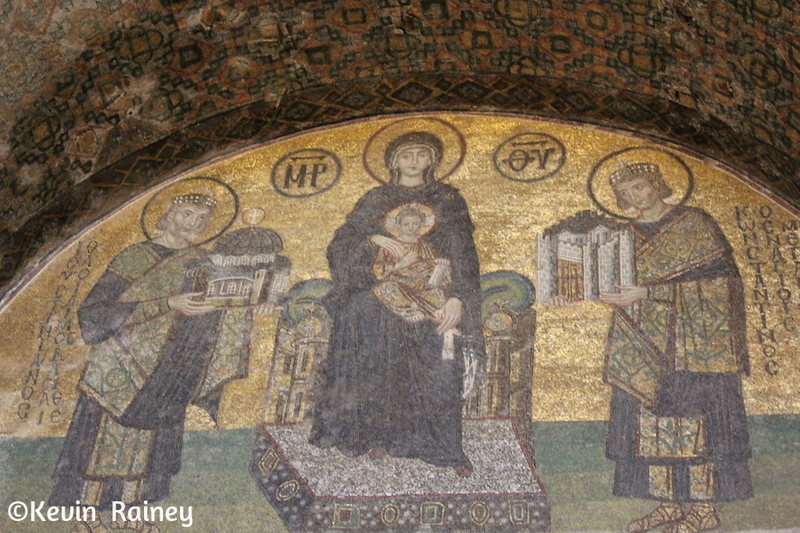 When the Ayasoyfa was converted to a mosque, many of the Byzantine mosaics were plastered over. Since the 1930s, historians have meticulously worked to uncovered mosaics that were hidden for centuries. 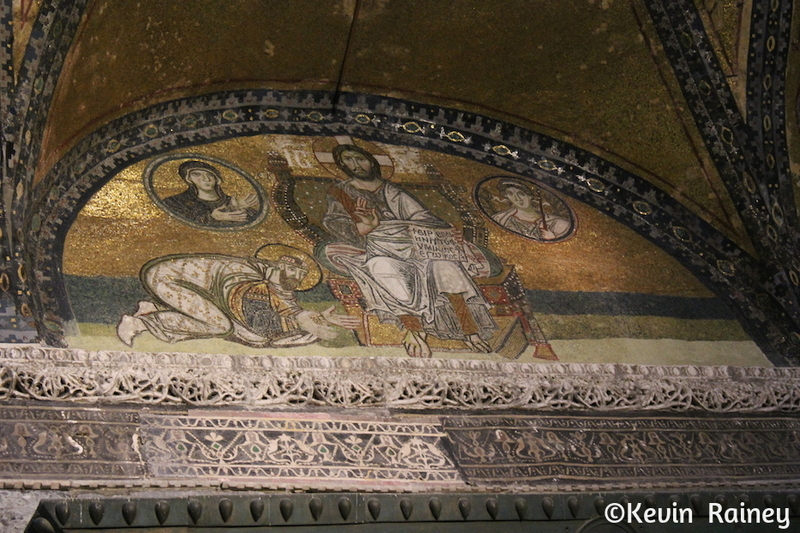 Some of these mosaics definitely are some of the most beautiful I have ever seen. 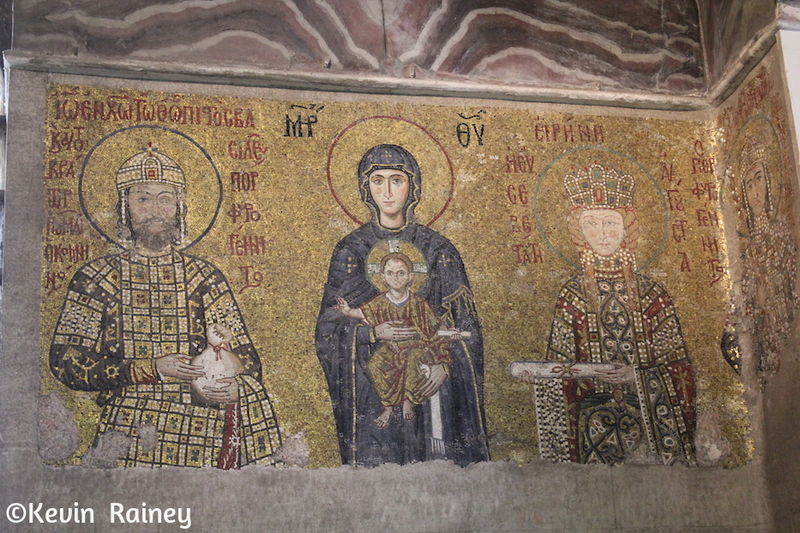 We saw intricately restored paintings of Christ, St. Nicholas, Mary and Constantine, among others. Some of the most impressive are in the entrance, but those in the upper gallery are also lovely. One interesting sight to see in Ayasofya is the Arabic script hanging on shields in the sanctuary. I don’t know hardly an Arabic, but I believe it says the Islamic creed of “there only one God but Allah, and Mohammed is his profit.” It’s interesting that these shields still hang as a subtle reminder that you are in a Muslim country. Afterwards, we took a stroll down the Sogukçesme Sokak. The cobbled 19th-century Ottoman lane runs parallel to the palace wall of Topkapi Palace. Then we entered the palace through the main gate. 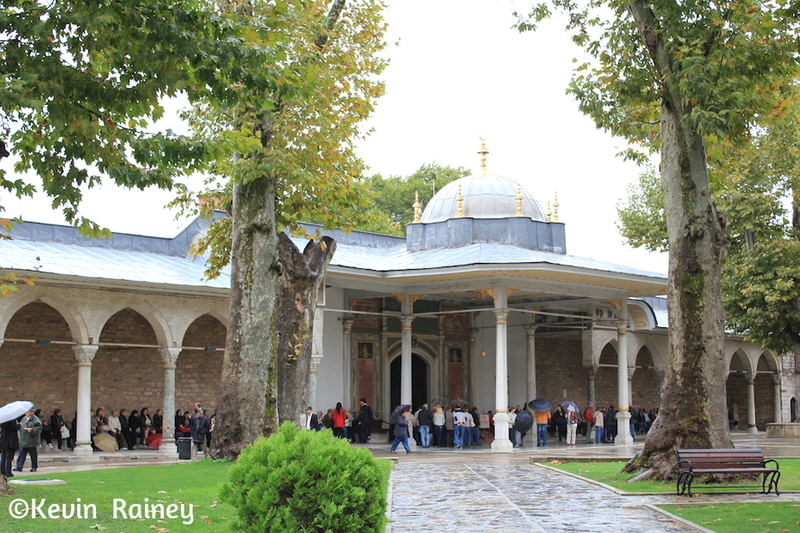 Topkapi palace was the former home of the Ottoman Turk rulers. The palace is the largest (and oldest) in the world, so we only toured a few parts of it. Surrounding its magnificent courtyard, the palace is part palace, museum, art gallery and religious facility. The palace itself sits on a hill overlooking the three bodies of water surrounding the city: the Sea or Marmara, Bosphorus and the Golden Horn. The views are fantastic, as it is surrounded by five kilometers of stonewalls with 27 towers. Inside the palace complex, we entered a couple of gallery wings and saw some stunning collections of jewelry, artwork, gold and precious metals. In another wing, we were privileged to see a number of holy objects. We saw the forearm and the hand of St. John the Baptist. For Muslim visitors, the highlight is seeing a tooth, the beard and footprints of the Prophet Mohammed. We were awed by the impressive collection of swords and armaments. Upon working up an appetite during our tour of Topkapi Palace, it was time for lunch. We boarded our bus which took us to Pandeli, a famous restaurant serving traditional Turkish dishes. The restaurant is close to the Spice Bazaar. We entered via a winding stone staircase to the restaurant with it’s turquoise tiles and domed ceiling. To drink I ordered a glass of pomegranate juice. My main course was kofte, which are spicy lamb meatballs served with rice and grilled vegetables. I also ate ezo gelin, which is a soup of red lentils, rice and bulgur. For dessert I had firinda sutlac, a baked rice pudding. We ate plenty of rice and the food was delicious! 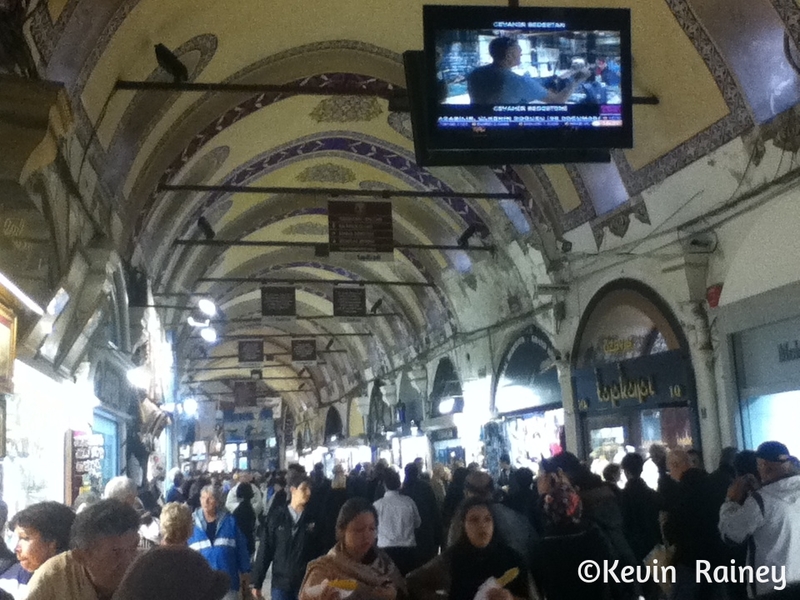 After lunch, we walked to the Kapalicarsi (Grand Bazaar), the largest and oldest covered market in the world. To say it’s big is an understatement. It stretches across 61 covered streets and features more than 3,000 shops! It attracts more than 400,000 visitors daily. Needless to say, our guide reminded us of the gate we entered so we could find her when it was time to leave. I am not much of a shopper, but the Kapalicarsi could almost make a shopper out of me. It truly had just about anything in the world that you could want to buy. Some parts focused exclusively on electronics, while others served food. 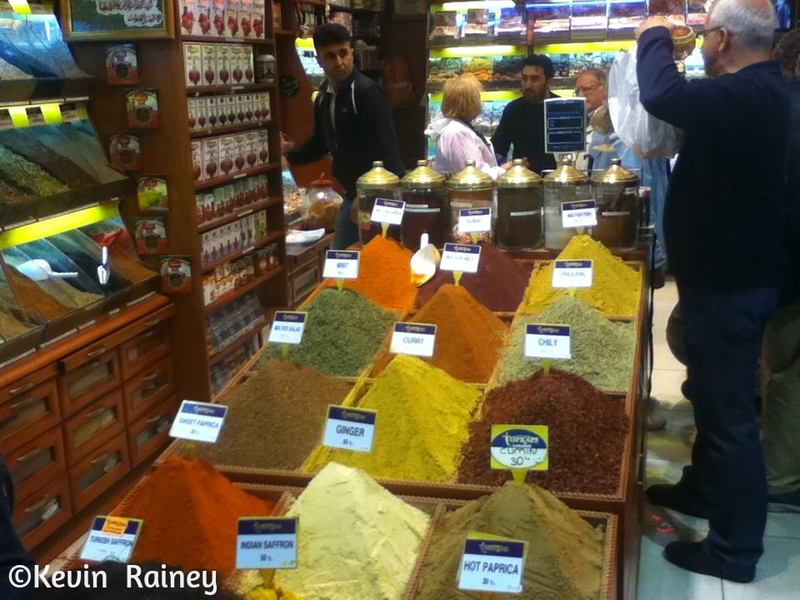 If you walked further, you would come to another section that specialized in spices. Further along, we encountered a quarter with gold, which was nearby another market with silver. Then around another street we came to section specializing leather goods. It has to be the most international place I have ever visited. I hear a lot of Turkish, Arabic, Russian, German, English, French, Chinese, Japanese, Spanish, Portuguese and Hindi. It is a little like the United Nations of malls! I bought a Turkish lamp and some Turkish delight candies. Because we wanted the entire day to explore the Grand Bazaar and city, we planned not to leave with our guide and told them not to wait for us on this final stop. The bus was going to drop off our bags at our hotel. After finishing our shopping, we toured the riverfront harbor of the Golden Horn. To our right we could see the Bosphorous Strait and the gigantic Bosphorous Bridge that connected the European and Asian sides of Istanbul. Admiring the beautiful harbor, I can truly say it’s one of the most beautiful cities in the world. After walking around for a while, we decided to take the M2 metro from Vezneciler to Yenikapi. The fares were cheap and only cost about TKL$ 1.75 (about USD $1). There we changed to the M4 to Yesilyurt, which was near our hotel. After arrival at Yesilyurt, we arranged a taxi to the Marriott Renaissance Polat Istanbul Hotel. We arrived, our taxi had to pass a bomb crossing barrier where guards examined the bottom of our car and trunk for anything suspicious. It was a great precaution, especially after another Marriott was bombed in Istanbul several years ago. When we went in the lobby, we also had to pass through metal detectors. I felt safe and was happy with the security. After checking into our rooms and having our bags brought up, we decided to see what our dining options were. We decided to eat at the adjoining Champions Sports Bar for our last meal while watching soccer. We had a great day in Istanbul. Great post and beautiful shots! Thanks John. It’s shame the skies weren’t blue that day. Istanbul is truly one of the world’s prettiest cities.